Do you love Italian food? Well, you’re in for a treat! I’m so excited to welcome local food blogger Kate Ailey, who has created an exclusive Chicken Cacciatore recipe especially for Mums Off Duty. Kate shares her simple, authentic recipes, and her love of wine and gin, on her lovely blog, Cooking and Carafes. Please check it out for some delicious dinner inspiration. You can also follow Kate on Twitter, Facebook and Instagram. If you try this chicken cacciatore recipe, we’d love to see your pics. Please tag #MumsOffDuty so we can see your creations! While I don’t have kids of my own, I have a tribe of nieces and nephews, from the fussy to the gourmet-eating child. My youngest nephew (two) and my eldest niece (nine) have been eating avocado and olives since they were one! This chicken cacciatore dish reminds me of my childhood and was a favourite recipe my mum used to make. Now I’ve taken that meal and made it my own. 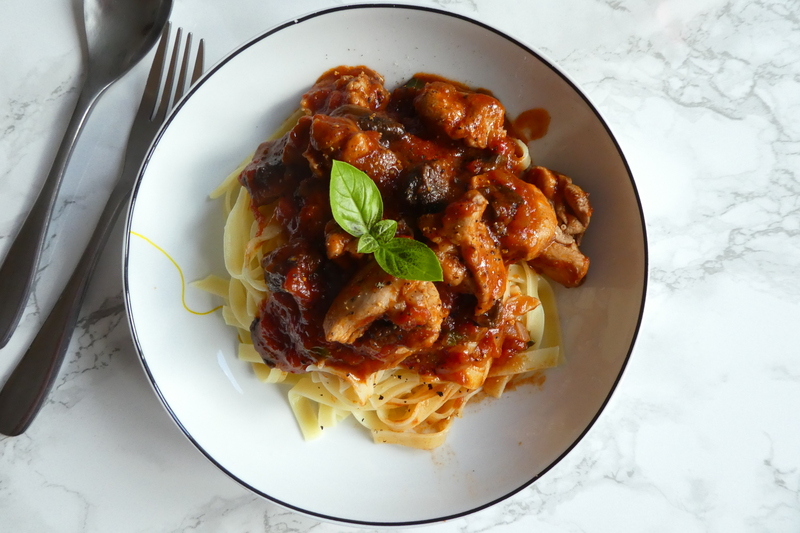 Cacciatore means ‘hunter’ in Italian, and if you look for chicken cacciatore recipes you’ll get a range of suggestions of what chicken to use and what extras you can throw in. I’ve kept mine simple but I adapt my recipes all the time based on what’s in the cupboard or the fridge, so I’ve suggested some alternatives too to make your life as easy as possible. 400g chicken thighs (skinless and boneless). You can just as easily use chicken breast if you prefer. You can cook this dish on the hob or in the oven. If you want to use the oven, pre-heat to 180°C (fan). Chop the chicken into chunks (suitable for your kids to eat), finely chop the onion, and tear the mushrooms. Add a good lug of olive oil to a stove-top pan (approx 4tbsp) on a medium heat and add the chicken. Season with salt and pepper and add the thyme leaves, and allow to brown for 4-5 minutes. Then add the onion and stir, continue cooking until it starts to soften (2-3 minutes) and add the mushrooms. Stir and allow to cook for another 2 minutes. If you’re happy to add wine, pour over the chicken and allow to bubble on a high heat for 1 minute. Add the chopped tomatoes and rinse out the can with a little water and add to the pan. If cooking on the hob, leave to simmer for 10 minutes with the lid on, and then put the lid askew for a further 15-20 minutes until the sauce has thickened. If cooking in the oven, bring to the boil, put the lid on and cook in the oven for 30 minutes. Leave enough time to cook your pasta; bring the water to the boil, add a pinch of salt and cook al dente. Tear some basil into the chicken dish and serve with the cooked tagliatelle. Depending on the age of your kids, this should make plenty and either leave you with some leftovers, or a happy, healthy, full family! If you want to add more veg, just add them with the onions and mushrooms. Courgettes (quartered) or peppers (sliced) are a great addition. If you have more time, add celery and carrot as part of a soffritto base with the onion. I used portobello mushrooms but use what you have – although chestnut would help add to the flavour.